(4) Figures to the right indicate full marks. 1 (a) Find the natural frequency of a half solid cylinder of a mass 'm' and radius 'r' when it is displaced from the equilibrium position and released as shown in Fig. 1. 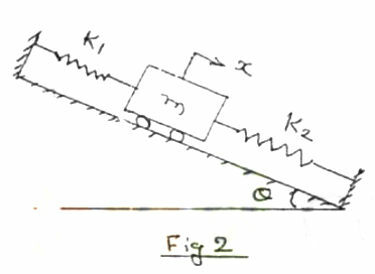 (10 marks) 1 (b) Using Newton's second law of motion find the natural frequency of vibration of a spring-mass system arranged on inclined plane as shown in Fig. 2. (14 marks) 3 (b) How is the critical speed of the shaft determined. 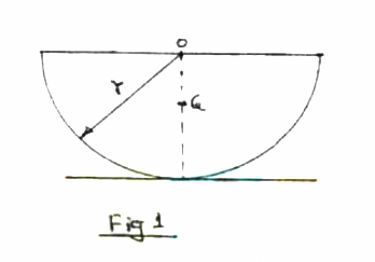 (6 marks) 4 (a) How do you find the response of a viscously damped system under rotating unbalanced? (10 marks) 4 (b) A machine of mass 50 kg operates at 1200 rpm. Find the maximum stiffness of an isolator that provides 75 percent isolation. Assume that damping ratio of the isolator is 7 percent. (10 marks) 5 (a) A spring mass damper system, having an undamped natural frequency of 100 Hz and a damping constant of 20 N-s/m, is used as an accelerometer to measure the vibration of a machine operating at a speed of 3000 rpm. If the actual acceleration is 10 m/s2 and the recorded acceleration is 9 m/s2, find the mass and the spring constant of accelerometer. (10 marks) 5 (b) Use Lagrange's equation to derive the differential equations governing the motion of the system, using x1 and x2 as generalised coordinates. Assume the disc of mass m and radius r rolls without slip.